>> Don’t Take the Red Pill! Recently, the Red Pill Movement has gained some attention from the press as a men’s rights movement, so it’s worth taking a look at the movement. The principle behind the movement is that men need to see the world for what the world really is, not the way men have been indoctrinated by society, gender roles, feminism, media and even marketing. On the surface it sounds like a good principle, but I think it worth setting some things straight. First some background. 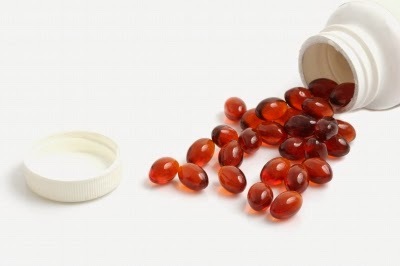 The Red Pill refers to a concept from the science fiction movie, The Matrix, and its two sequels. In The Matrix, most people live inside a giant computer simulation and exist for the benefit of machine intelligences. So called “reality” is a computer generated simulation fed into their physical brains, and the simulation is called the Matrix. Occasionally someone inside the matrix will start to understand that reality isn’t quite what it is cracked up to be. Other people from outside the Matrix have a way to find these people and offer them a way out, that is, they offer the people in the Matrix a metaphorical “Red Pill”, which is actually a program that will disconnect them from the computer simulation and allow them to see Truth. (Sadly, in the movie, truth is not all it’s cracked up to be either.) The other option is a metaphorical Blue Pill that will erase any hint the people have that there’s something wrong. As such, the Red Pill has become a cultural metaphor for seeing the world as it really is, and the Blue Pill a metaphor for ignorance. The Red Pill Movement offers men a chance to see the nature of modern gender roles as they really are, not as men have been programmed to believe by the media and society. Men who take the Red Pill supposedly see things clearly and learn how men and masculinity have been systematically oppressed by society, the legal system and in particular, women. Men who are Blue Pill live in a false and foolish reality, created for them by feminists and the media. Men who take the Red Pill supposedly are on their journey to be real men. That’s what is supposed to happen. Outside the movie, the Red Pill / Blue Pill is a false dichotomy; an erroneous way of thinking. It assumes that there are only two choices, and when one choice is bad, the other must be good. There is no basis to believe there are only two choices; there very well may be more. 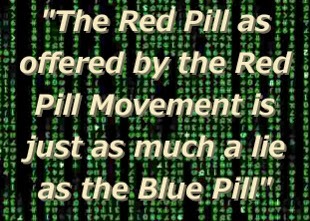 An astute observer will notice the Red Pill as offered by the Red Pill Movement is just as much a lie as the Blue Pill. The Red Pill simply moves men to an entirely different matrix, plugging them into a different but equally false simulated reality. No matter how appealing, avoid the Red Pill at all costs. In the Blue Pill matrix, men are the evil oppressors and women are the victims, therefore in order to be “better” men, Blue Pill men are supposed to be apologetic and supplicate themselves to women as a way of apologizing for all the evil done by other men and society. “Good” men are portrayed in the media as either ineffectual buffoons, easily dominated by smarter women, or as evil bastards out to dominate the world and abuse all women on their masculine power trips. Sounds pretty crazy, right? In the Red Pill matrix, women are rising up to be the evil oppressors themselves. They are rising with the help of the media portrayal of men as buffoons, feminism and a legal system that preferentially supports women’s rights and denies men rights. Women are to be hated as the enemy against both real Red Pill men and those men who still don’t have a clue. This sounds pretty crazy too. As an old adage says, the opposite of crazy is still crazy. Admittedly, swallowing the Red Pill is a movement away from the “nice guy” syndrome, in which men have voluntarily, or unknowingly, sacrificed themselves for the benefit of the matrix, but it’s a pendulum swing from one extreme to a different extreme. From unconscious servitude to conscious hatred of the masters. Neither extreme is good. 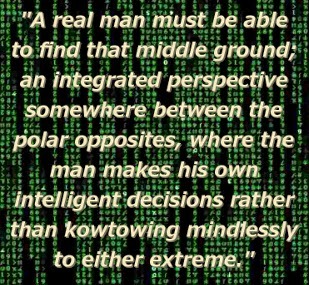 A real man must be able to find that middle ground; an integrated perspective somewhere between the polar opposites, where the man makes his own intelligent decisions rather than kowtowing mindlessly to either extreme. To my mind, the Red Pill Movement has swung the pendulum to the point there is nothing “rational” at all to it. The Red Pill Movement is built on a foundation of misogyny and hate towards all women. I’ve been there. I recognize it. In order to see the misogyny, you need to read more than the typical Red Pill articles and opinion pieces. The misogyny is plainly evident in the forums and discussion groups. The vitriol against women in the forums is highly caustic. Each and every time I peruse the forums, I walk away feeling dirty, as if I’ve wallowed in filth. The men who are attracted to these forums have been wronged, and are quite willing to lay the blame on women in general. Their utter shock at realizing the world is not the way they thought has muddled their minds, and they are quite willing to lay the blame at anyone’s feet except their own. In this way, the Red Pill crowd is still very much “Blue Pill” in blaming everybody else except themselves. In the movie, Neo had a mentor to lead him through the new reality. Morpheus coached Neo through the basics of understanding the difference between reality and the matrix. The Red Pill men do not have the benefits of a coach or mentor. In some ways, Red Pill men are more like the children in The Lord of the Flies, building their own form of chaos due to the lack of any genuine authority figure to lead them in their new red pill matrix. In the Red Pill matrix, the imaginary beast that unites these men in fear is a societal conspiracy against men. Buried inside the Red Pill matrix are the occasional nuggets of wisdom; sometimes Red Pill men share sources of good advice on living like a real man, or establishing healthy relationships. The trouble is that in order to find these nuggets a guy needs to dig through lot of misogynistic garbage; a guy can’t help but be contaminated by the filth. This is not a place for a male to learn manhood, nor an impressionable teen to learn how to develop masculinity. If a guy has trouble learning to be a man, he won’t be able to readily sort the nuggets of wisdom from the garbage. If he has the skills to extract the sense from the Red Pill and discard the horrific nonsense, he didn’t really need the Red Pill in the first place. Men are much better off finding other avenues to regain their man hood. There aren’t a lot of pill colors left. The purple pill is already taken, and Advil already has a green pill, and yellow is just, well, yellow. I would suggest taking the clear pill, but the clear pill is some kind of movie now. Whatever color you find, make sure there is nothing artificial, no preservatives, no hatred or misogyny. Just real masculine sense.